In one of the smallest mountain ranges of Europe, in the southeastern corner of Saxony you can find the most beautiful part of the Oberlausitz, the Zittau mountains. At the heart of the mountain a health resort waiting to be discovered - the climatic health resort of Jonsdorf. Established by the shepherd Jonas, a monk from Cölestinerkloster on Mount Oybin, is today a place of relaxation in the more than 150 years tourists are welcomed. The place, with its pleasant climate and picturesque half-timbered houses is surrounded by a romantic mountain landscape. The family-friendly resort offers every season an extensive Leisure - and recreational facilities. Kurort Jonsdorf located in Dreiländereck- Poland, Czech Republic and Germany, enabling day trips to the Jizera and Giant Mountains or Prague. 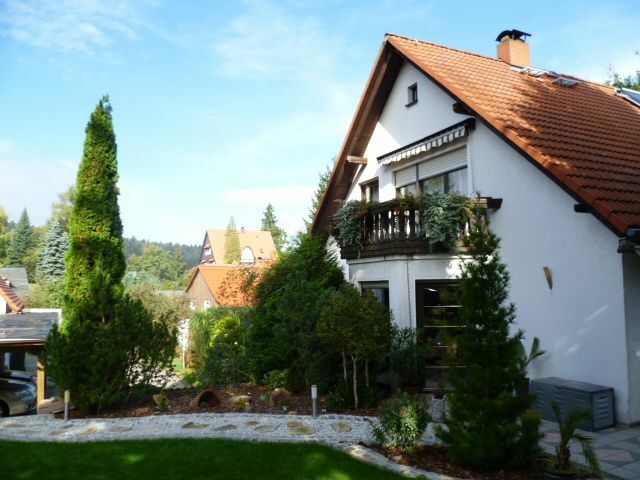 The apartment is located near the town center of Jonsdorf. Feel at home in our lovingly furnished 50 sqm apartment at home and make yourself comfortable. The apartment can accommodate two to four adults. There is a living room / bedroom with a double bed (1,60 mx 2,00 m). Here you will also find a sofa, an armchair and a TV with satellitePort. There is also a bedroom with two single beds (0,90 mx 2,00 The installation of an additional small cot (to 36 months) is possible by prior arrangement. Linens and towels are included in the price. In the kitchen there is a stove, oven, microwave, coffee maker toaster, kettle, fridge and dishes. In the bathroom is a small sauna and a shower, hair dryer, sink and toilet. On request there is the possibility of bread and breakfast services are available upon request. Many small amenities like our little sauna in the bathroom, the balcony, a parking lot to contribute to a pleasant stay. The nearest supermarket is located about 500 meters away. A restaurant and public transport are located around 200 m away far. The nearest cross-country ski track is just 1 km away. Likewise, far away there is the swimming pool of the resort and the train station. Pet possible. Dog up to 30 cm in height. schöne Ferienwohnung, ruhig und vor allem für die Wanderer günstig gelegen, sauber, super Ausstattung (incl. kleiner Sauna) mit einem top - Frühstück und super netten Vermietern. Wir haben uns sehr wohl gefühlt und kommen sehr gern wieder. der Gesamteindruck einfach Toll !! Bettwäsche & Handtücher sind im Preis inbegriffen. Kleine Haustiere auf Anfrage erlaubt 10,00 € pro/Aufenthalt. Kurtaxe 1,40 € pro Person/Tag an Vermieter zu Zahlen! Anreise Montag bis Donnerstag ab 17:00 Uhr . Abreise bis 10:00 Uhr. Anreise Freitag-Sonntag 15:00 Uhr. Abreise bis 10:00Uhr. Buchungen bis 4 Tage vor Anreise möglich.